Hadn't realised it had been quite so long since my last post. Been pretty busy lately, but getting in a bit of hobby goodness where I can. Looking forward to getting my hands on some of the new Citadel paints. I can recommend the April issue of White Dwarf 388 for anyone wanting to find out more about the new paint range. It's one of those issues that may not be totally accessible for newcomers or occasional readers, but for me, this months issue is right on the money. 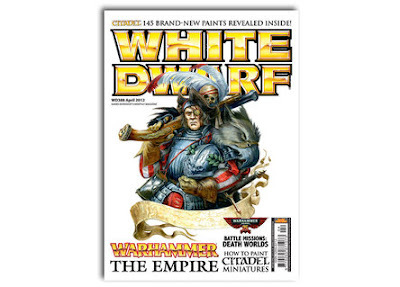 There's some great looking stuff coming out for the Empire, plus official deathworld updates for the Battle Missions book. Outside of this, I was lucky enough to get some new paint spraying kit and the Imperial Strongpoint Realm of Battle extension tile for my birthday recently. The RoB tile is pretty good; it needs the usual soap and water treatment before I do much else with it as there's quite a bit of dust and mould soap still left on the casting. There are a couple of places where the moulding is a little rough, and some green stuff is needed to fill a gap over the top of the blast doors where the resin was too thin. I'm going to add some extra rubble here and there where details aren't too clear, but it should scrub up well I think. I've also finished the assembly stage of my Deathwatch Kill Team and am really pleased how they've turned out. More on those to come. Until next time, laters folks.